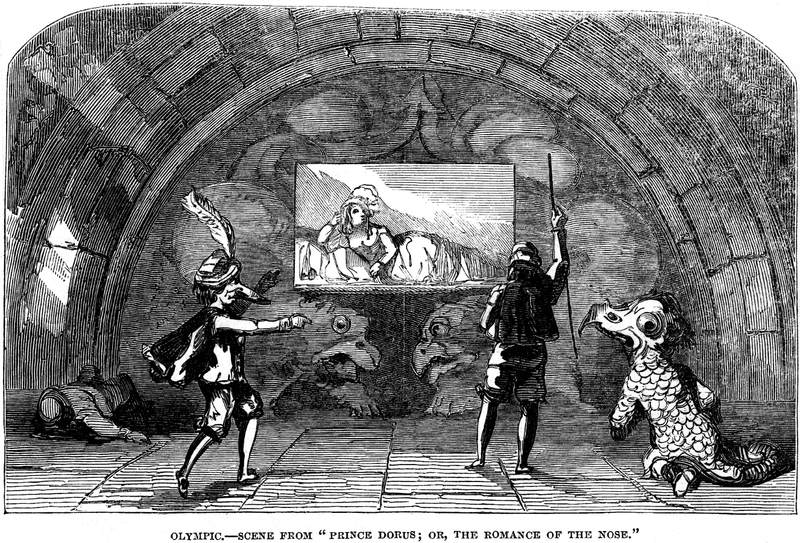 Scene from Prince Dorus; or, The Romance of the Nose at the Olympic. 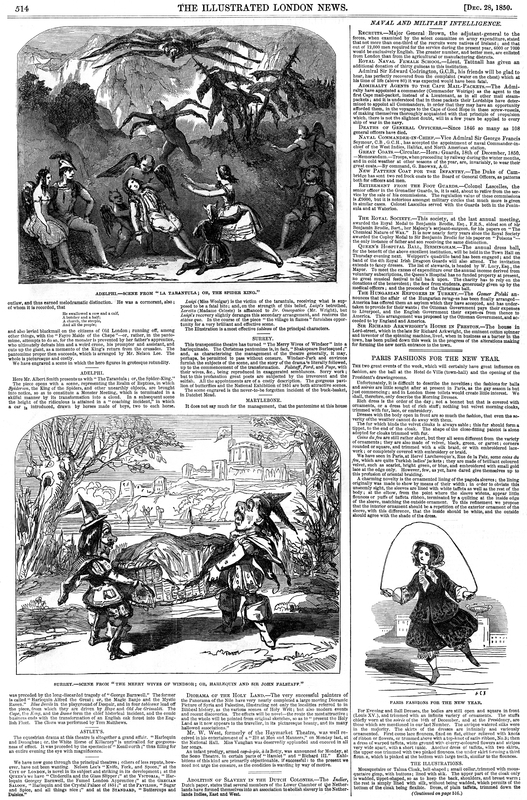 Mr. Tom Taylor takes the subject of Madame D'Arblay's "Prince Doras" for his Christmas piece—the pet of the good and the prey of wicked fairies. The latter curse the child in its cradle with a big nose. Furiosa is the name of the "heldam," whose nasal malediction becomes so inconveniently objective in another. 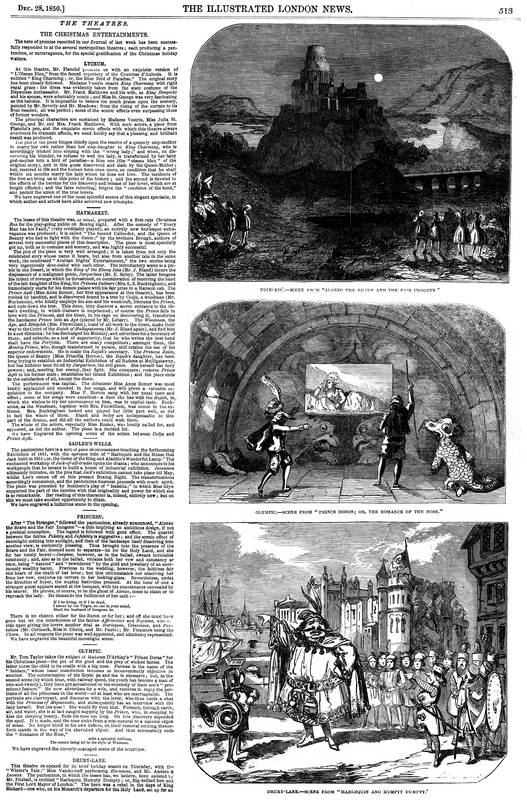 The consternation of the Royal pa and ma is excessive; but, in the second scene (by which time, with railway speed, the youth has become a man of one-and-twenty), they have got accustomed to the enormity of their son's "prominent feature." He now advertises for a wife, and receives in reply the portraits of all the princesses in the world—all at least who are marriageable. The portraits are clairvoyant, and discourse with the lover, who thus holds a chat with the Princess of Mignionette, and subsequently has an interview with the lady herself. But the nose! She would fly from that. Pursued, through earth, air, and water, she is at last caught napping by the Prince, who, in stooping to kiss the sleeping beauty, finds his nose too long. On this discovery depended the spell. It is made, and the nose sinks from a non-natural to a natural organ of sense. No longer blind to his own defects, on their removal nothing thenceforth stands in the way of his cherished object. And thus successfully ends the "Romance of the Nose,"
The scenes being all in the style of Watteau. We have engraved the cleverly-managed scene of the interview.